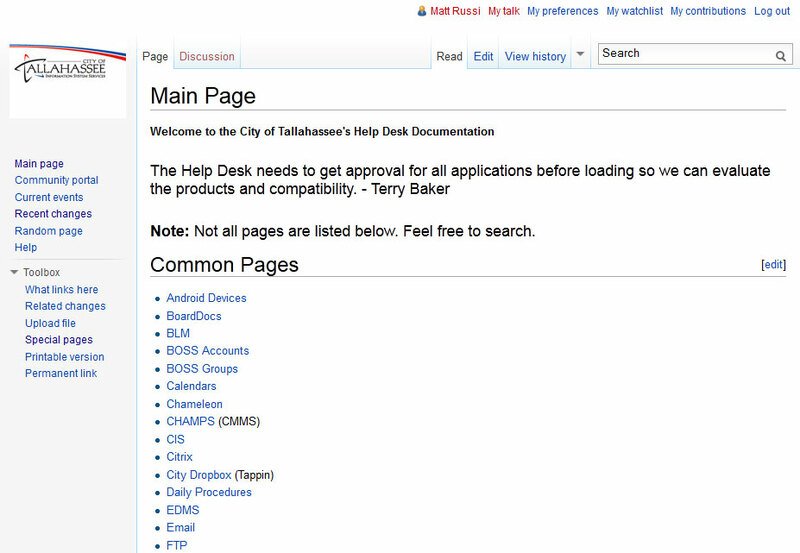 When I first started my job at the City of Tallahassee, there was no internal operations manual that provided documentation of the Help Desk responsibilities. In order to resolve this, I researched the best ways to allow for collaboration between not only myself but my Help Desk employees as well. Originally, I began with a Google Document (Docs) that was shared with each employee. In the early days, this worked out very well. It was easy to search with everything on one “page” and Google Docs are geared towards collaboration. However, as we added more and more content, it became a hassle to maintain. One day while traversing the website on one of my favorite open-source projects, XBMC, I found their wiki was run on the free, open-source software called MediaWiki which also just so happens to also power the one of the world’s largest free encyclopedias, Wikipedia. I realized that this provided a superb collaboration platform for documenting information. In order to use it, MediaWiki requires a server that can run PHP. I then setup an installation on my web server to allow all of my Help Desk employees easy access. The wiki is restricted to Help Desk employees only. Throughout this process, I have learned how to efficiently document technical operations in order for anyone to easily follow.